Myluckypage123.com is the PUP that uses misleading techniques to prevent removal. Use Reimage to locate malicious components and get rid of them faster than with uninstall instructions. A full system scan blocks virus reappearance and prevents traffic to malicious domains. Myluckypage123.com virus is a program that affects Firefox and Chrome web browsers in order to convince people to use a fake search engine. It is classified as a browser hijacker that spies on user’s browsing sessions to collect search queries, the list of websites visited, IP addresses and similar information. Once the hijacker collects enough information, it starts pushing targeted advertisements to the computer user by inserting third-party links into search results. There are many identical copies of this search engine, for instance, Mybeginning123.com, InitialSite123.com, and InitialPage123.com. All of them look the same and work the same way – instead of providing useful search results that are organic, they serve links that third-party companies want to promote. Unfortunately, not all sites promoted this way are secure and 100% legitimate, so we always recommend users to stay away from them. Some of these websites might try to talk you into installing “extremely useful” programs that will actually appear to be dangerous or simply annoying, while others might ask you for some sensitive information such as name or email address just to clutter your inbox with spam. Spam is often associated with a distribution of malicious programs, so be extremely careful when revealing your email to someone. One of our grounds to recommend users to remove Myluckypage123.com redirect virus is that it sneaks into the computer system silently – it doesn’t clearly ask for user’s permission to be installed. If this shady search engine was presented to you without asking you for permission to set it as a default browser’s search engine and also homepage address, you should not tolerate it and put an end to its activity right away. The safest way to eliminate the potentially unwanted program is to use anti-malware software for its detection and removal, however, if you do not have such software, you can use Myluckypage123.com removal tutorial that is provided below and uninstall the potentially unwanted program by yourself. If you decide to download anti-malware software to clean your system from suspicious programs automatically, we suggest using Reimage or Plumbytes Anti-MalwareMalwarebytes Malwarebytes program. 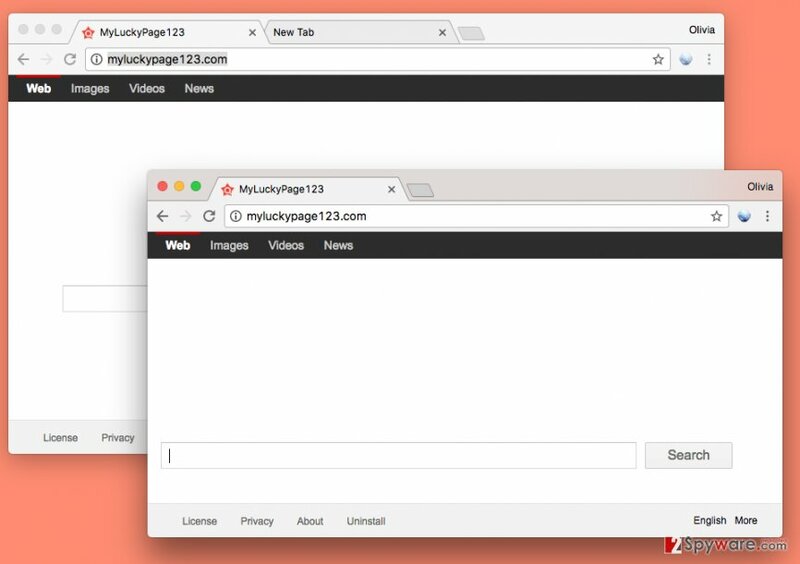 Users should stop using Myluckypage123.com search if they care about their privacy and computer's security. Choose Custom or Advanced settings for software installation. Do not rely on Standard or Default ones because these are typically filled with permissions to add additional programs to your PC. To stop unwanted redirects, remove Myluckypage123.com virus by eliminating its files from the computer system. What you want to do first is to find programs related to it and uninstall them. Next, you should check browser’s shortcuts for any hidden elements. Finally, you should clean your browsers from various add-ons and extensions that these browser hijackers added. If you carried out these instructions but redirects to the described search engine do not cease, we suggest you go for automatic Myluckypage123.com removal option and solve the problem expeditiously. First things first, you have to take care of suspicious programs that sneaked into your computer without your consent. You will find them easily if you use the instructions we present. Here, look for Myluckypage123.com or any other recently installed suspicious programs. Wait until you see Applications folder and look for Myluckypage123.com or any other suspicious programs on it. Now right click on every of such entries and select Move to Trash. When in the new window, check Delete personal settings and select Reset again to complete Myluckypage123.com removal. Once these steps are finished, Myluckypage123.com should be removed from your Microsoft Edge browser. Here, select Myluckypage123.com and other questionable plugins. Click Remove to delete these entries. Now you will see Reset Firefox to its default state message with Reset Firefox button. Click this button for several times and complete Myluckypage123.com removal. Search for questionable components in your Chrome browser. You should find some in “Extensions” section. Here’s a tutorial that explains how to find it. Here, select Myluckypage123.com and other malicious plugins and select trash icon to delete these entries. Click Reset to confirm this action and complete Myluckypage123.com removal. Here, select Extensions and look for Myluckypage123.com or other suspicious entries. Click on the Uninstall button to get rid each of them. Here, look at the Homepage field. If it was altered by Myluckypage123.com, remove unwanted link and enter the one that you want to use for your searches. Remember to include the "http://" before typing in the address of the page. Now you will see a detailed dialog window filled with reset options. All of those options are usually checked, but you can specify which of them you want to reset. Click the Reset button to complete Myluckypage123.com removal process. ^ The most dangerous browser hijackers of February. VirusActivity. Information about Latest Malware Activity & Trends. ^ Searching the web can be dangerous. 2-Spyware. Fighting Against Spyware. ^ How to Tell If A Website Is Dangerous. Gizmo's Freeware. Free Technical Support Site. ^ Darya Gudkova, Maria Vergelis, Nadezhda Demidova, Tatyana Shcherbakova. Spam and phishing in Q1 2016. Securelist. Information about Viruses, Hackers and Spam. ^ Yahoo Redirect virus. How to Remove? (Uninstall Guide). 2-Spyware. Fighting Against Spyware. This entry was posted on 2017-04-24 at 03:34 and is filed under Stealing programs, Viruses. You can quickly scan the QR code with your mobile device and have Myluckypage123.com virus manual removal instructions right in your pocket. How did you remove Myluckypage123.com virus?